How Much Do Central Air Conditioners Cost? How Does Central Air Work? Your home’s central air conditioning system is a critical component when it comes to cooling your home and being comfortable. When considering a central air conditioner installation or repair there are some things you should know in order to complete an HVAC installation project. Understanding how much central air installation costs, what to expect with the installation process, and how to hire a qualified contractor are all essential to getting the best return on your home investment. Central air conditioners cost between $3,200 and $7,800 for replacement or for a new AC unit installation. The average cost for a central AC unit will depend on the size of your home, the square footage of rooms needing to be cooled, the central AC system brand, the energy efficient level (SEER), potential ductwork installation or repair, and also the average local costs for hiring a contractor in your area. See price charts below. Central air conditioners require a high degree of training, knowledge, and experience to properly install. Both of the main components—the evaporator and the condenser—are sealed units; therefore, special training and tools are required to service them. Choosing the right central air conditioning contractor is as important as choosing the best HVAC system. Before hiring an HVAC contractor, verify that your contractor is licensed and insured. If hiring within the Modernize network, we vet all of our contractors so that you don’t have to. The BBB (Better Business Bureau) is a great place to vet your contractor, as they will have any complaints, lawsuits, or concerns on file regarding the applicable HVAC contractor. Online reviews are also helpful in determining if your central AC contractor is a great choice. Click here for a full checklist on hiring an HVAC contractor and questions to ask before making your decision. There are certain projects a homeowner can do before they have their new central air conditioning unit installed to ensure you’re getting the best return on your investment. Use our step by step guide on exactly what you should expect with an HVAC installation from start to finish. Peak performance from your central air conditioning system. Increased energy efficiency as a finely tuned and maintained unit will consume less energy, reducing your energy costs. Early warning of potential equipment failures in the future. A peace of mind knowing your home’s central air conditioning system is in A1 condition and using energy efficiently. You will also want to have your AC coils cleaned regularly, which can be done on your own. A central air conditioning system is comprised of two main components referred to as a condenser (3) and an evaporator (1). The condenser resides on the exterior of your home, usually placed on a small, concrete slab where it is easily accessible. 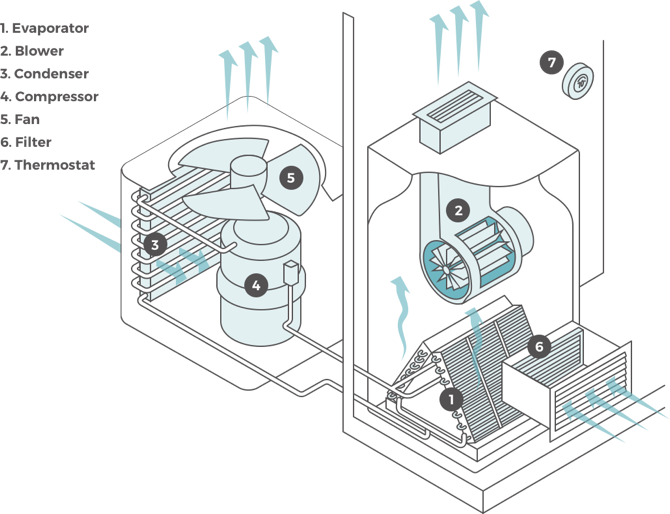 The evaporator, including the evaporator coil and air handler or air blower (2), is strategically located inside the home, usually in a closet dedicated to the unit. The HVAC evaporator might be located in the attic as well. In homes where a furnace is used, the evaporator will reside above it where it connects to the plenum or a duct junction for air distribution. If you do not have a furnace or other heating source, your central air conditioning system may be equipped with an electrical resistance heating element to provide your home with warm air during the winter months. Since we are talking about a central air conditioner, this article will focus mainly on the cooling aspects of an HVAC system. In either case, a central air conditioning system falls under the forced central air distribution category, meaning the same ductwork, motor, and blower are used for both heating and cooling your home. Once the unit is activated, hot air is drawn from the house into the return air vent and pulled across the evaporator coil to cool it. The fan and blower assembly provide the circulation to draw in and distribute the conditioned air through the ductwork to cool the house.